Club Penguin Cheats by Mimo777 Club Penguin Cheats by Mimo777: Club Penguin's Screenhog On Night Club Secrets! "You know, the Night Club is one of those places where there's often a lot happening. And recently there have been some upgrades that make it even more interesting. You might have noticed that when there's more than 10 of you in the room, the lights change. But did you know that if the majority of you (at least 10) are the same penguin color then even more cool things start to happen?" Yeah, I think most of us have already figured that out, didn't we? Oh well, he also wants us to figure out what happened to the green puffle that is missing from the Night Club. Umm, didn't we already figure that out too? 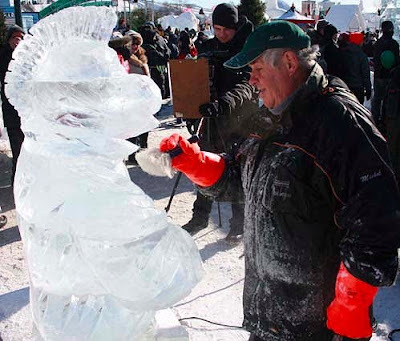 Any way, remember when we voted for an ice sculpture that would be at the Carnaval de Quebec? Well, Club Penguin is just now showing what the winning sculpture, "The Rocker," looked like. We already posted some cool pix from this Carnival back in February. If you wanna check them out, click here. Did you already know about the Night Club changes when you have 10 or more penguins the same color? What about the green puffle, do you know where he is? ive seen it in a sot with no one around so it couldn't have been a penguin walking a puffle but then it gone in an instance p.s it was at the mine. Awesome! I think the green puffle will be in the cave. Nah! Lol! if we saw that yellow puffle, then it must be there. If u remember in missions, Herbert had a plan with puffles. That must be to do with it. =) Thats what I think anyway. I agree with u Ceejerz i think its herbet or it MIGHT be the new game tht's supossed to come out this week.Anyhow good theory Ceejez. Awesome! Tons of you agree with me! Thanks! ;D What was ur username whizzbobrox? I might remember u coz I see tons of ppl lol! Anyway Thanks again for the agreement! Lol! Great! The green puffle is probably at the mine and the yellow puffle is! Maybe it has something to do with herbert's puffle plan! Oh and i think the rumors about the golden puffle were actually rumors about the orange puffle! They are nearly the same. Anyway the orange puffle is SO cute! Don't you think mimo?? cool. i am going to make people red. lol! LOL, ikr. Anyway, dont put "CPG Mod" after your name if you arent modding. Thanks! Hmmmm, intersting theorty. I think you may be on to something! Nice job! I do have to agree the orange puffle is cute! (: Im not sure if there really is a golden puffle but who knows?! (LOL, Only CP) And I think your right about the puffles being in the mine. Maybe they are having a party XD Just a thought.LOL ,and dont put "CPG Mod" after your name if you arent modding. Thanks! Yup i agree. Screenhog needs to speed up. Mimo they aren't slow your just too fast! Any way CP has been making things pretty obvious lately anyone else think so? 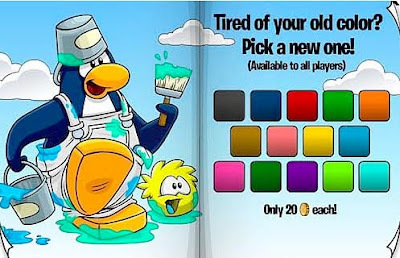 cool but why the picture of the colors?is it the yellow puffle in it? cool. awesome new website format. I emailed Club Penguin and they said they will be working on it soon! Sorry I haven't been modding lately. Really busy. Lol! Yup! Don't forget to not put (CPG Mod) when not modding. Same with me. Haven't had the time to mod. Hi Mimo, love the new header and stuff. Sorry if it's been there for a really long time. As I said before, I haven't been to the site in a long time. Just click the little circle next to it and enter whatever name you want. Yoiu don't have to use the url part. All Hail Mimo! The Great King! I know! It's awesome! I love it too!